Born to a poor family in Hamburg, to a father musician and a seamstress mother, Brahms was showing signs of possessing an extraordinary talent. Brahms left school at the age of fifteen in order to earn some money. He studied music while supporting himself by playing piano at bars and clubs. After settling in Vienna , he established a fine reputation, both as a conductor and as a composer. He was noticed and encouraged by Liszt and Schumann . Brahms was very much in love with the latter's wife, Clara Schumann , who was an extremely gifted pianist herself and whose advice he always valued. After Robert Schumann's death, however, they decided not to spend their lives together. This fact had a significant effect on his works and he expressed his distress in the music he wrote at the time, including the first drafts for his First Symphony and the exquisite "German Requiem". That work established him as a well-known and famous composer all over Europe. At this time, having written only chamber works, concertos, piano music, and choral pieces, Brahms turned to writing the four symphonies and his Symphony no. 1 in C minor, Op. 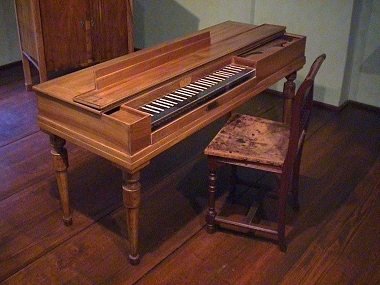 68 was called "Beethoven's Tenth" by a famous conductor, as Brahms saw himself continuing the classical tradition from the point to which Haydn and Beethoven had brought it . 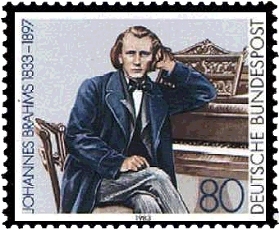 Brahms carried the standard of composition in the Classical style, meticulous and economizing in orchestra size, and opposed the tendency observed among Romantic composers such as Liszt and Wagner toward personal, free composition in terms of form, like the symphonic poem , and larger orchestras. His compositions combined the Classical forms with the early Romanticism. Many of his later chamber works are more Romantic than ever, including the charming Quintet for Clarinet and Strings in B minor. His influence on Mahler and Schönberg was profound.